We have been around for a while now so have a read below to see our story. “Pantonic All Stars” Steel Orchestra is a Stockport based group of talented young people, dedicated to playing steel music. They were established in 1985 and now usually comprise up to 25 players aged between 11 and 25. The group has gained recognition as one of the Country’s leading youth Steel Orchestras, having been presented with the Outstanding Performance Award twice in the National ‘Music for Youth’ Festival and performed at many School Proms concerts including St. David’s Hall, Cardiff, and the Royal Albert Hall, London, where they have been fortunate enough to make four appearances since 1989. They have also been featured several times on radio and television in arts festival and youth programmes including Blue Peter (twice!) and the ‘Young Entertainer of the Year’ semi-finals on BBC1. Steel pan music originated in the Caribbean in the 1940s and was brought over to the United Kingdom, and many places in Europe during the following years. Steel pans are all made from oil drums, which are then shaped for the notes and chromed to preserve their quality and give the sunshine sound of steel music. All our pans were made in this country by West Indian pan makers and our tutors were from the Caribbean for the first twenty years which has brought the traditional sound and style to our music. The Orchestra has performed in Europe on many occasions, most recently in Belgium in 2017, tours Devon every three or four years, and regularly appears at Caribbean evenings, shows, carnivals and shopping centres throughout the Country. The Orchestra operates in the name of Stockport. 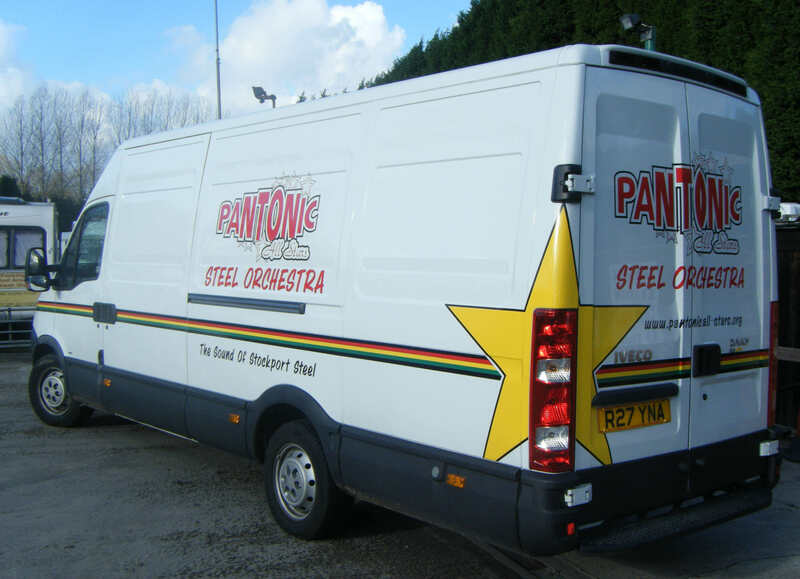 All public appearances operate behind a banner proclaiming Pantonic All Stars Steel Orchestra – the “Sound of Stockport Steel” and our vehicles sport the same logo on their sides. Our Orchestra stands alongside the independent steel bands of the World. We are just as they are, in that our formation was the idea of just two people who, along with the support of some of the parents and charities we raise money for, brought together their children and formed the basis of the Orchestra in November 1985. Thirty three years later and the charity involvement lives on and regular gigs are played so as to ensure a steady flow of money is given to the charity we collect for (The Royal Manchester Children’s Hospital Bone Marrow Trust Fund). Over one hundred and thirty musicians have passed through the senior group over the past 33 years and added their own individual mark upon the aura of the Orchestra. The original founders may have moved on, but the motto we have held since the beginning still remains “We Not I”. 2018 kept all the players and parents very busy right through to Christmas with many of our regular venues revisited as well as several new ones. We enjoyed great weekends for our annual visits to the Cumbria Steam Gathering at Flookburgh, and the Yesteryear Rally at Malpas, Cheshire. The Orchestra also worked hard during the year with our licensed charity collections for the Royal Manchester Children’s Hospital Bone Marrow Trust Fund, which we have supported since 1985 in several North West shopping precincts. With other donations from supporting organisations, the total donated to date now stands at over £55,000. We have now become the largest single contributor to this worthwhile children’s charity. Outside of our main charity work, we also supported a number of other charity events during the last few years including Cancer Research UK and Joining Jack in Wigan. As usual there have been a few changes in the line-up of the Orchestra over the last twelve months as a number of players have left to concentrate on college and work. We are now twenty four strong and have plenty of players available, even when some are working or on holiday. It will be good for the summer’s busy schedule, which is kept up to date alongside as we progress through the year, with more details of times etc. if you click on the locations. Paul Handley continues with the majority of our tuition to junior and senior players, supported by Steve Marshall and other long serving senior players. Ashley Hogg provides drum tuition at junior practices with training for new young drummers. We are still looking to recruit drummers to supplement our regular ones who have continuing work commitments. We had a good number of junior players join us in 2018 and intend to take them out with the senior Orchestra in the spring. 2019 will find us in most of the counties of the north of England and Wales You are always welcome to come and see us at our many venues and keep in touch through the link to our Facebook page. With a stream of up and coming players in our Junior Section we are always guaranteed a solid playing force and always open to welcome new young players. Our future is dependent on a constant influx of new talent and our junior orchestra is the perfect place for them to develop their skills as artistes. Paul Handley, our Musical Director, looks after the teaching with valuable help from experienced players. The learning curve can be steep but well worth the effort for those who are prepared to put in the work. In January we are moving to new rehearsal facilities at Hazel Grove High School, Jacksons Lane in Stockport. The junior section practices every Monday night from 7.00pm through till 8.30pm. For further details please contact us.